It’s going down this weekend with my good brother G. Love & Special Sauce as he takes the stage on 3/10 & 3/11 at the Belly Up in Solana Beach, California. At the show I’ll be releasing a limited edition of *three* archival pigment prints on canvas of “Baby’s Got Sauce” which will be signed by “G”. Prints are of the original collab painting by @random_avenger85 and I which was completed as Garrett was jamming during Art Basel Miami 2017. Print sizes: 15”x15”, 12”x12” and 10”x10”. 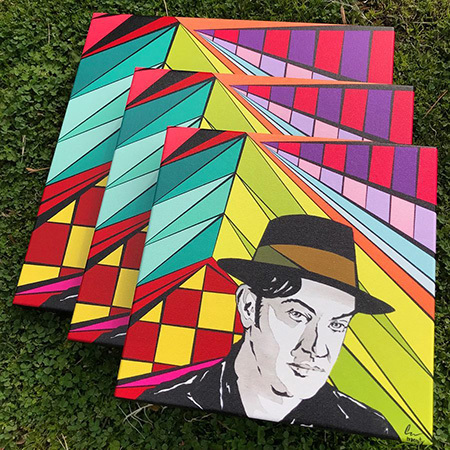 Unsigned prints can be ordered through the Shop on montymontgomeryart.com #glovespecialsauce #solanabeach #bellyuptavern #livemusic #sandiego #montymontgomery #urbancontemporary #montyart — at North Park, San Diego.